A housing recovery, however you define it, is clearly not imminent. So, it was good to see President Obama address an issue that I mentioned in my column last year that being a plan to assist homeowners, who are not delinquent with their mortgages, to refinance and take advantage of the historically low interest rates. Many of these folks are unable to qualify to refinance their loans due to loss in home values. Implementing a program which would enable this group of homeowners to lower their monthly payments will put more money in their pockets and perhaps provide some fuel for the economy. 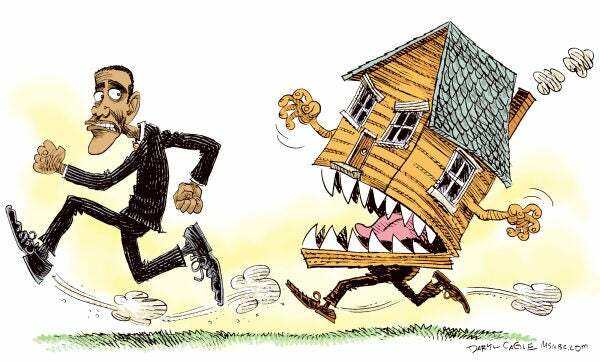 The second part of Obama’s plan is to dedicate 15 billion dollars to refurbish damaged and rundown foreclosed properties to prevent neighborhood blight, while simultaneously making those homes more sellable. While assisting some homeowners to refinance and fixing up the neighborhood eyesores are nice ideas, they do not address the main problem with the housing market – the lack of qualified buyers to take on the massive inventory of homes already in foreclosure. I have repeated this mantra for a year, and it still holds true. We do not have enough qualified buyers in this country to soak up the massive inventory of homes currently on the market. We will likely not have enough qualified buyers for years to come. This time around, President Obama is not promising “the world” to the American people, like he did with HARP. The White House plan to refinance 4-5 million homeowners fell seriously short. Even at the time, the promise was unrealistic. If nothing else it gave me a good fit of laughter, which, they say, is good for the soul. After numerous mortgage assistance programs, a massive influx of capital and historically low interest rates , where are we today? We have just passed through the prime selling season. How did it go? The weak economy continues to take its toll on the confidence of home buyers. The recent upswing in the cancelations of home purchases is a further testament to this fact. No job growth, no income growth, a jittery stock marketand the back drop of a Euro Zone collapse, have collaborated to defeat the appetite for new homes in the few qualified home buyers we have. There are those who, for all good reasons, should take the leap from renter to owner today. Yet, they don’t. Some I have spoken with are concerned about mobility factor. In a shaky economy, the risk of losing ones job still exists, and the need to relocate could suddenly present itself. These renters have seen the financial and emotional carnage of not being able to sell a home to move forward. Also, the banking sector is a mess. The numerous lawsuits combined with the lack of a settlement on the Robo signing fiasco means the Banks are still in financial capital limbo. So there are a lot of new factors for prospective home buyers to consider besides falling home prices. Even so, you may hear from housing experts that the housing recovery is just around the corner. The very kind expert will say, “Why, you just take three more giant steps straight ahead, and turn right under the lamppost and Voila! You will see a happy thriving Main Street USA!” When it doesn’t prove true, they simply move the “recovery” date up a year. Stubborn facts, however, have a way of dashing even the most pleasant hopes and dreams. The fact is that housing needs time, time and more time before we can claim a true recovery. Much like our national economy, the housing market is in a deleveraging phase. The fact is the American consumer is both unwilling and unable take on debt like they once did. Exotic, ill-conceived loans, which, thankfully are no longer offered, pulled too many buyers into an untenable financial situation. Inflated demand led to an oversupply of housing, and it is going to take a national sustainable and credible economic recovery to provide the buyers to soak it up. Americans must believe in the strength of our economy, and have confidence in housing again before home buyer will be willing to take on the biggest debt most will have in their lifetimes. In summary, my belief is that while President Obama’s plan is well meaning and acknowledges that many Americans need assistance in refinancing, the plan, even if flawlessly executed, will not cure the core problems in housing. For a few homeowners, however, Obama’s modest plan will put a bit of extra money in their pockets each month — Let’s just hope they spend it wisely!